Alright peeps, mangoes are officially here and they are getting sweeter by the day. I’m on high pimple alert at the moment because apparently, eating too many mangoes does that to your face. But we will brave those zits because mangoes are not forever, neither are pimples. 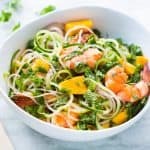 And there are sooo many delicious ways to use them like this cucumber noodle prawn and mango salad which also happens to be gluten free! Not that I have any gluten intolerance but if any of you do, this salad is especially for you. 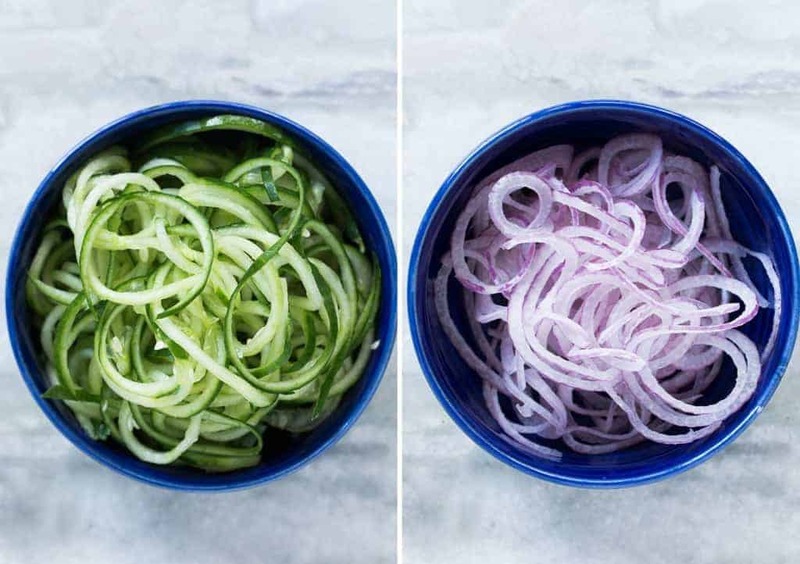 Today I’m also introducing you to my newest kitchen tool which is fighting with my cast iron pans for #1 spot on my list of favorites – The Spiralizer which lets you make the most beautiful vegetables noodles in the world. Yes, noodles from vegetables. Imagine zucchini noodles, cucumber spirals, apple noodles, curly fries? I’ve been using them in everything! Salads, soups, rolls, curries; sometimes replacing noodles entirely like in this salad where I used cucumber noodles in place of rice noodles and sometimes just adding to them. I have to warn you. Spiralizers are one of those kitchen toys that you just can’t stop experimenting with. The first day I was left with mounds of spiralized carrots, cucumbers, zucchini that I had no idea what to do with. But it’s sooooooo much fun!! I really feel that these cucumber and onion noodles made this salad even more fun to eat. I was already convinced that this combination would kickass but when I added the noodles, it just seemed way more legit. Like a real, healthy salad with zero carbs. And look at those big fat tiger prawns. Aren’t they a beauty? I got lucky with this lot, so I froze some and used some. This salad is inspired by Thai flavors and reminded me so much of my trip to Bangkok where we would stand on the street and eat shrimp and mangoes off sticks. Oh oh oh and mango sticky rice!! And if you are vegetarian, substitute the prawns with tofu or other vegetables you like. Anything goes in this salad because the dressing is so delicious. I also love that I can serve it cold which just makes all those flavours taste even better. In this cloying Bangalore heat, there is nothing like slurping on cold cucumber noodles! Are you a big salad lover? Follow my salad board on Pinterest for daily inspiration! 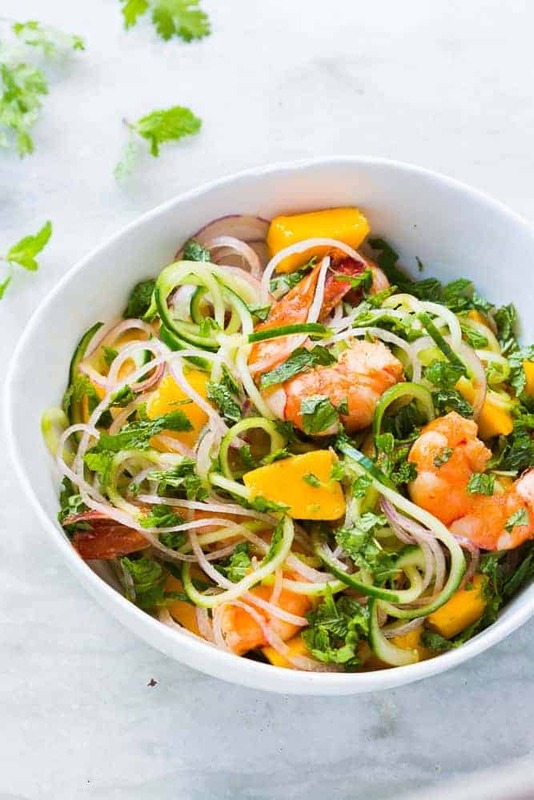 Recipe for a fresh cucumber noodle prawn and mango salad which is also gluten free. All the thai flavours of Bangkok in this hearty spiralizer salad recipe. Sprinkle salt and pepper on the prawns and slide them into the pan. Pan roast them for 3-4 minutes on each side till they are cooked. For smaller prawns, the cooking time will vary. Alternatively you can also blanch the prawns in hot water to flash cook them. Whisk together the remaining oil, sweet chilli sauce, fish sauce, vinegar and salt to make the salad dressing. 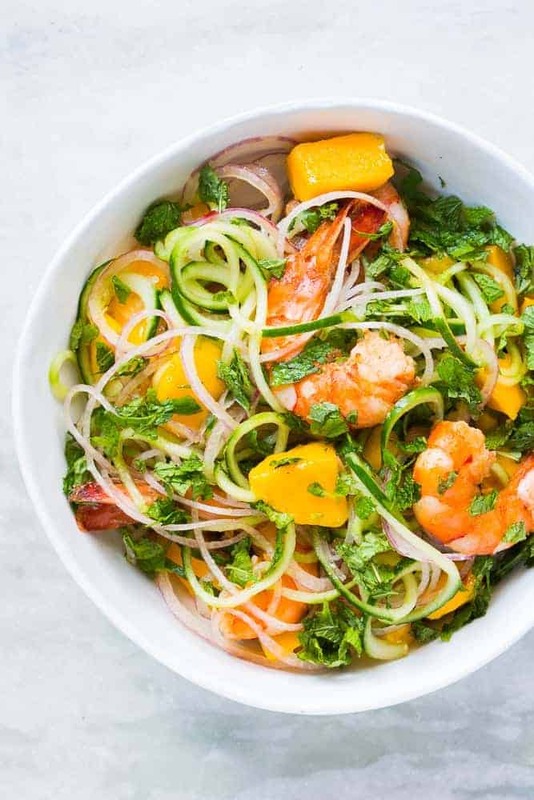 Add prawns, mangoes, cucumbers and onions into a bowl and drizzle with salad dressing. Toss to combine. Top with freshly chopped mint leaves. Note: If you are serving this salad at a later stage, do not mix the dressing or the vegetables will leave water. To serve later, mix everything except the dressing and refrigerate. Toss in the dressing just before serving. This is so beautiful, I need to get a Spiralizer so I can make this salad!! Pinned and definitely sharing this one!